It has been said that Pro Stock Motorcycle veteran racer Michael Phillips does the most with the least. The resourceful privateer further established that reputation by assembling arguably the greatest season of his career in 2009. Phillips’ success often requires some difficult, calculated and prudent business decisions. For instance, last season he had the opportunity to upgrade to Vance and Hines’ modern, more powerful engine. Phillips’ problem was he couldn’t justify spending around $35,000. Instead, he opted to update his existing equipment, eight-year-old power plants he purchased from V&H in 2002. One may assume such a move would leave a racer with virtually no chance for victory in such a cutting-edge and technologically-advanced class. Phillips somehow defied the odds. Extraordinary riding ability, razor-sharp reaction times and vast tuning knowledge helped guide him to his first NHRA Championship Countdown, where he would finish a respectable sixth in the Full Throttle point standings. Ever since entering the category, the often self-funded Phillips has dealt with the great divide which exists in Pro Stock Motorcycle racing. On one side are heavily-funded teams with major sponsors; on the other side is a group of individuals following their dream by paying astronomical racing expenses out of their own pockets. Many of these racers seek to rapidly build a winning reputation and convert the success into a key sponsorship deal. Unfortunately, most succumb to the sport’s heavy financial burden long before that. Yet “do-it-yourselfer” Phillips has managed to stand the test of time. After accruing 17 years in the highly-competitive category, Phillips resume reveals two event wins, seven final round appearances, and a best ET and speed of 6.919 and 196.70 mph. With a track record like that it’s hard to believe Phillips, for the most part, has done it all on his own. “I’m no rookie but they like to treat me like one,” laughed Phillips. Excluding his brief stint riding for team owner Harry Lartigue from 1992-1995, Phillips has competed as true privateer, often with no outside funding at all. Phillips has become accustomed to finding success as the underdog. For him, performing well isn’t only a goal, it’s a necessity. Throughout much of his career Phillips has competed on a race-to-race basis, using his winnings from one race to enter another. In 2009 Phillips maximized his yearly qualifying payout. The talented rider made the cut for all seventeen races and along the way scored an event win in Memphis and appeared in three final rounds. Overall Phillips finished with a 16-16 round record. Phillips reluctance to upgrade his equipment has caused some disagreement and tension between himself and his engine provider. “With the proper updates I think the old stuff is a little better than the new stuff,” Phillips said. That’s clearly a 0ff-putting statement for a business with a new product to hear. But Phillips did a convincing job of backing up his claim. 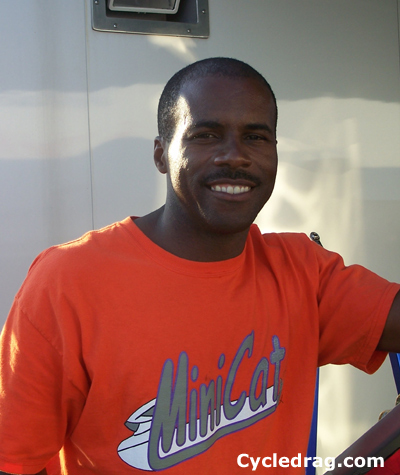 Not only did he win a race himself, but his friend and quasi-teammate Craig Treble, who unexpectedly found himself without a sponsor for 2009, went on an incredible early-season hot streak, winning Houston and Englishtown and finishing runner-up in St. Louis. He did it using a 10-year old chassis and a motor he borrowed from Phillips. “Michael is the reason I’m out here. He’s the reason I won this race,” an elated Treble said after winning Englishtown. Indeed Phillips hopes to do it again in 2010. Phillips will continue to campaign a Suzuki. He feels that although the V-Twin entries have a slight edge, the four-cylinder bikes can still win. His only worry is that the Screamin’ Eagle V-Rod’s may have a lot more performance capabilities than what’s often seen throughout the race weekends. Despite the conspiracy theory Phillips isn’t about to quit trying anytime soon. He hopes to end the season the same way every other prominent racer does – as an NHRA champion. It’s good to see small teams win.